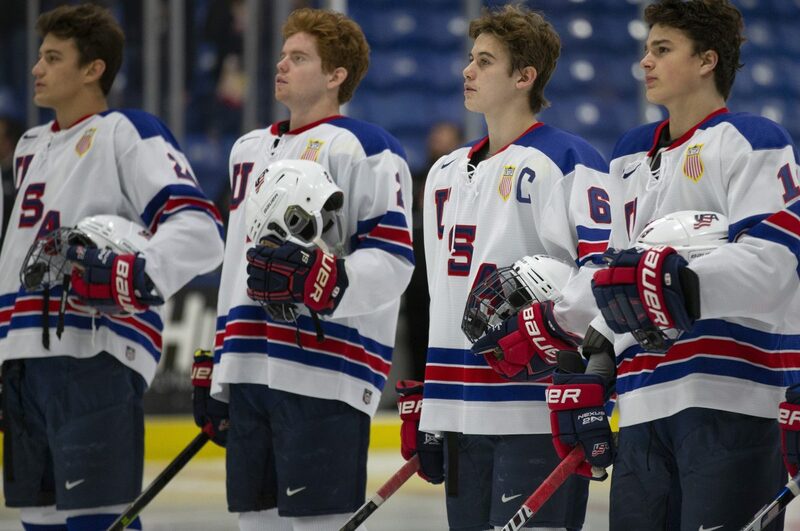 A powerhouse 2018-19 USNTDP dominates the 2019 draft rankings. Here we are with the penultimate draft rankings for the 2019 class. Many players considered for the list below have finished their seasons. Others in in their respective leagues’ playoff pushes. The Harlem Globetrotters USNTDP U18 team is still dominating everyone in their path, including the rankings below. We currently feature seven national program members in our projected top 31 and a few more who have just missed. In one sense, this ranking has a feel of “plus ca change, plus ca meme-chose”. On the other, there are some noteworthy changes to the previous ranking. Near the top, Jack Hughes still holds on to the highest ranking, but Finnish wunderkind Kaapo Kakko is inching closer to the pole position. Both talented forwards should have a final chance to prove themselves at the upcoming U18 tournament in Sweden. An indication of how close the two player are is that if Kakko was a center like Hughes, or Hughes a winger like Kakko, the spots might be reversed. We see that Russian forward Vasili Podkolzin has been bumped down from the third spot to fifth. 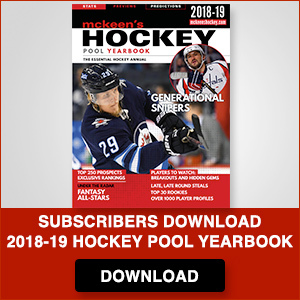 That change is more connected to lackluster production in domestic action more than talent, but a touch of the fear that he may not come over to North America for two or three years will likely impact his actual draft stock more at the end of the day – if those rumors are proven to have merit. We don’t move him down much, but when you are listed that high, every slot counts. 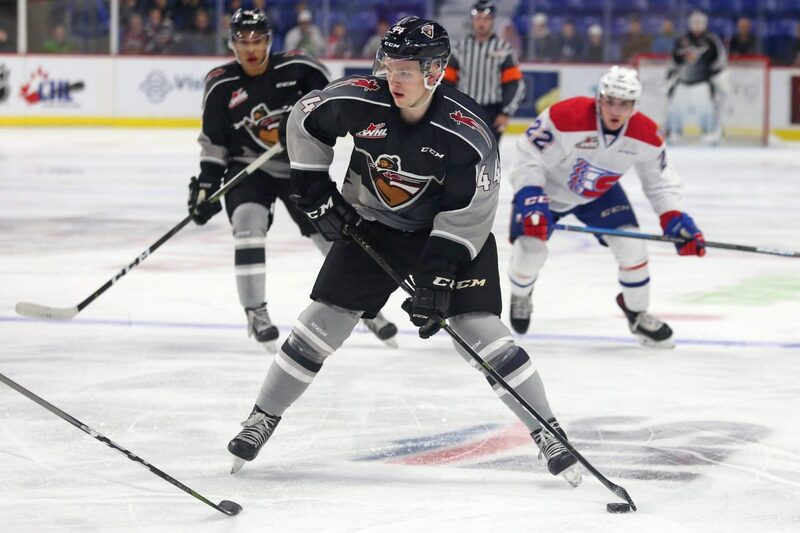 Filling that vacuum are WHL talents Kirby Dach and Bowen Byram, two very different player who both have high end potential. Dylan Cozens is right behind those two, and for now, slotted on the far side of Podkolzin. All three are so close that they could end up in practically any order once we end the rankings after the season runs to a finish. A handful of prospects have dropped out of our first round between our mid-year ranking and this one. WHL wingers Nolan Foote and Brett Leason only fell a few slots in what is essentially a numbers game and a lot of time in the spotlight allowing some flaws (lack of a dynamic skill set for Foote and footspeed concerns for Leason) to drag them down. We have also moved Spencer Knight out of the first round, returning to a core principal that goalies should not go in the first round. In Knight’s case, while his skill set is first round worthy, the risk is too high. He has little experience being a workhorse and we simply don’t know how his play will be impacted by a great increase in playing time. Secondly, the team in front of him is so dominant, he has scarcely been tested yet. He is still the top netminder in the draft class, but a much safer bet for the early second than the late first. Finnish blueliner Ville Heinola was one of our bigger droppers this time out, dropping from 25 to 41. We still appreciate his overall game, but he simply lacks one big selling point for a first-round appraisal at this time. Our biggest drop from the first round goes to Quebec league winger Jakob Pelletier. We knew he was small when we had ranked him originally, but we have (we reserve the right to change our minds in the next few weeks and months) concluded that his foot speed and skill game are not enough to make up the difference. He is a good player, and well worthy of a pick, but our former 20th overall ranked player is now down at 53. So, who has jumped up into the top 31 to replace the fallen? The highest ranked newcomer is Swedish winger Simon Holmstrom, who has torn up the Swedish U20 league and his late May 2001 birthdate suggests at a higher untapped upside still in store. He jumps in at 14. Some late looks suggest that our previous assessment of Mississauga defender Thomas Harley were too harsh. He is big, is a beautiful skater and has a strong transition game. He now is ranked 21st. Towards the end of the first round, we now include Albert Johansson, a Swedish blueliner, at 27, while QMJHL winger Samuel Poulin is 30th and WHL import defender Lassi Thomson closes out the first round. Between these final three skaters and the players they have replaced, there is not much of a gap, but we simply feel that they all have higher floors, and are thus somewhat safer on day one. You may have other questions about our rankings, and we invite you to ask them either via email or on twitter. We take great pride in the 20-80 grading system that we use to sort through the world of prospects, allowing us to compare players from one league to another and we go to great lengths to ensure that our approach is systemic and repeatable.